I am so excited to share this book today! I am a huge fan of this series and this may be one of my new favorite books! I LOVED this book! 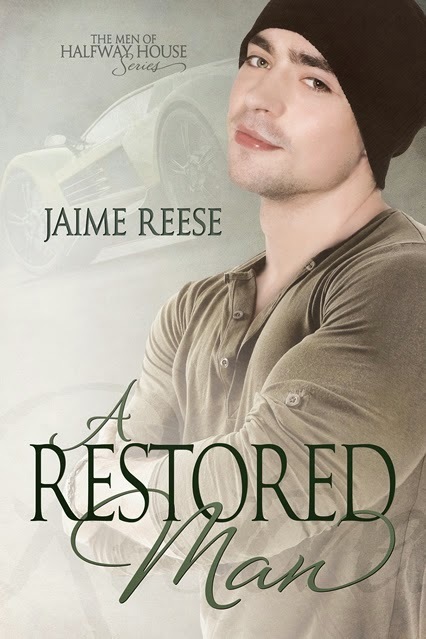 A Restored Man may be my favorite in this series, and I love this series! Jaime Reese has created a wonderful world with these men. Cole and Ty are very, very different men who find each other at a pivotal time in their lives. Cole is living in a half-way house after serving a prison term for stealing a car. Ty is the owner of a shop specializing in top notch work on exotic cars. When Cole gets a job working at Ty’s shop, it’s a chance to prove to himself and those around him that he truly is a good man. Ty is recovering from a horrible accident that took his family from him. Despite an instant chemistry between the two men, the question is can they move beyond the past to freely enjoy the future. I absolutely adored Cole from the very beginning! He is beyond adorable and I think I spent the book just wanting to hug him. He is a very bright man who has a hard time controlling his mouth, it seems he doesn’t have a brain to mouth filter. And, it’s one of my favorite things about him. Despite his uncensored sassiness he has an amazing heart and love for his family. Ty is such a wonderful, sweet man that I couldn’t help falling in love with him from the first moment. He is dealing with a difficult past that haunts and pains him daily. When he meets Cole when he comes to work with him, suddenly he finds his smile and his laugh again. There aren’t words for how much I loved these two together. It was like they brought out the best in each other from the first moment and never stopped. Both men are dealing with pasts they would rather forget, but their ability to work through it all together truly touched my heart. This was a wonderful story about the power of love and it’s one I will undoubtedly read again and again. Ty and Cole are absolutely perfect as the imperfect men they are and I truly enjoyed their story. Thank you Jaime Reese for this wonderful story showing that you do not have to be perfect to deserve amazing love. I cannot wait for the next story in this series, this is absolutely a favorite for me! I was provided with a complimentary copy for review for TheGeekery Book Review.